People ask whether there is such a thing as cat grief. There are no easily accessible scientific studies, that I can find, which deal with this subject. Perhaps, though, we don’t need them. Perhaps we already know from personal observation and experience. Grief is the emotion that we feel when we lose something, usually a companion or someone close to us. It can apply to an object rather than a living being but we usually associated grief with the loss of someone we know. We know that cats feel emotion. This is readily apparent. Cats become angry and aggressive or suffer from anxiety. One form of anxiety for a cat is separation anxiety. These are well documented. My cat has experienced this when I was working hard and away a lot. The anxiety caused stress, which in turn caused cystitis. Research by Dr Paul Morris at the University of Portsmouth, England indicates that cats have emotions and are more self aware than we thought. This research applies primarily to dogs but applies to other animals. He found that dogs can react in a jealous manner, for example, when they try and break up a relationship between the dog "owner" (keeper) and another person. Dr Friederike's research at the University of Vienna's neurobiological department supports these findings. He described dogs feeling strong emotions of jealousy when they observe that other dogs are getting preferential treatment. If cats feel emotion why not cat grief? Cats form social bonds. When these bonds are broken, for whatever reason, anxiety occurs1. Even shortish breaks between cats can affect their relationship. But lets remind ourselves that cats are individuals. Some cats will feel loss more than others. An American study of companion animals living permanently indoors found that when one died the survivor showed behaviour that indicates that it “mourned” the loss. 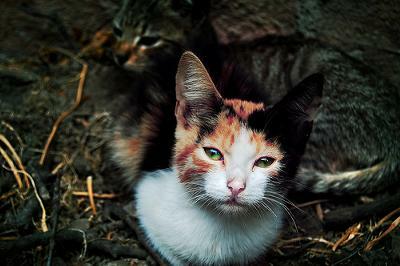 over 40% of the surviving cats sought out the deceased’s favourite spot and spent more time there. This happened for 6 months after the death. This last finding, although informal somewhat contradicts the former findings. Although I don’t think it does. Initially a cat mourns and grieves because, like us, a cat has lost a companion. The cat is used to a companion. Habits and lifestyle have been created around the presence of a companion cat and/or human. The loss affects the cat emotionally. When the cat has readapted it becomes more relaxed as it is then at a fundamental level more in tune with its true solitary nature. That is my analysis of it. Other people including the regulars will probably have different views, which is fine and the way it should be. Some well known cat people have personal experience of cat grief. Sarah Hartwell who runs the Messybeast website says that she has personal experience of the effect of cat grief on two cats who suffered the loss of their human companion. The cats were put in a shelter and then were looked after by a fosterer. One recovered slowly but pined for a long time. The other never got over the loss; and failing to eat at all, suffered liver damage and was eventually put down. One question that is as yet unanswered is whether cats comprehend the concept of permanent loss through the death of a companion. There are indications that cats do understand that a companion is dead and therefore that there will be permanent loss. This seems plausible. Cats are very sensitive animals. I am thinking of Oscar the cat that can tell if a patient in a hospice is about to die. The ability to detect impending death may be due to the scent given off the person. This begs the question whether a surviving cat should be allowed to be with the dead cat to allow it to mentally adjust to its permanent passing. My cat Calvin had to be put to sleep after a long illness. I was fortunate to be able to do this in my home where he was more comfortable, but unfortunately I did not think to allow my other cat Maxine, his lifelong companion, to be at his side during or afterwards. From the first night and for more than a month afterwards Maxine would awaken me crying loudly and seemed almost in a panic (heart racing, breathing heavily)--she would calm once I held her, but this was completley atypical behavior for her. I think she was in a state of anxiety maybe after waking up to find herself alone. She did a lot of walking around appearing to look for him as well. She eventually adjusted and may have even enjoyed the additional attention she got from me, but I'm convinced that she felt a loss, just as I did and do. Then when old Rudolf died, Milly grieved for a long time. Even years later she still reacted to his name and took a quick look around whenever she heard it. And despite being interested in all kinds of boxes she would never go anywhere near Rudolf's transport box after seeing him leaving for the final ride to the vet. MY cats greived for about a month after we had to take Kachina back to the Breeder. Even though we brought Arora home with us they did not accept her immediatly. In fact they hated her. They would look in Kachina's cage as if she would magically appear. Lia was the worst. He almost only ate enough to stay alive. Him and MIdnight were both very sad. They mopped around. It took about 2 months before they fimally accepted Arora. We still miss Kachina and I do stay in touch with the breeder as to her progress. He said she is very calm as long as you dont try to pick her up. Well we are too happy with little Rory. She is not a lap cat but I am able to at least pick her up and kiss her a little bit. She sleeps by either me or my boyfriend. It took a while and I felt very guilty about returning Kachina. But now we are back to one big happy family. My brother's cat, Midget, grieved when his Alsatian companion, Grizzly Bear, passed. Since Griz passed during the night, Midg was allowed to sniff the carcass and spend a few moments alone prior to bro taking Griz for cremation. We knew Midg understood when he started howling in anguish whilst laying in their mutual favorite spots. This went on for 2 solid weeks before finally coming to terms. Even now, at times, he'll display the same behavior. At our local shelter, we see cats whose humans passed and they display depression, refusal to eat and appear listless. We spend extra time with them, holding them, giving extra love and attention. We've seen amazing results after awhile but it takes time. In my opinion cats suffer grief just the same as we humans do and like us they never get over the loss of a loved one, be it person or another animal. All that happens, again like us,is that with time comes acceptance that the loved one has gone and we have become used to not having them around any more. Our cats grieved for our late mother and Walter in particular grieved for my brother in law who was special to him. Both Walter and Jozef grieved for our girlz Popsy and Ebony when they died, but eventually just like us, they accepted it. I believe cats do have emotions and feelings, just because they can't put it into words doesn't mean they feel any less than we do. Our 6year old cat pebbles had her first liter of Kittens 5 years ago. We kept 2 brothers screech and Dino. Screech was my baby. They were together indoors for 4 years. Last year I treated all 5 cats with hartz flea and tick treatment for cats not knowing the effects. Screech became very ill very quickly. We took him to his vet and we were told that brand of treatment kills cats. There was nothing they could do. I took him home where he was comfortable. He would cry if I wasn’t next to him on the floor. As long as I was there he purred and continued to knead. He passed away while I was at work. I felt in my heart the exact time it happened. We didn’t let the other cats go by him BC we thought they would upset him. Dino,his brother, has not been the same since. He is very vocal,he looks at the ceilings and lets out very odd meows. More loveable. But seems lonely. He has now grown more attached to my cat,bb,who is not his brother,but I have had since birth. BB is 1 year younger. But it’s been a little over a year,any suggestions?